Companies are always looking for unique ways to advertise. Our Get Paid to Drive Program offers companies an alternative way of advertising using your vehicles. 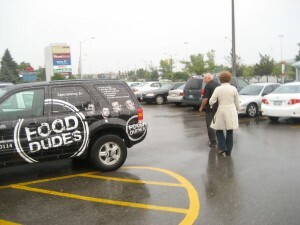 We essentially rent the space on your vehicle and use it to advertise a business or a product. In return, you receive up to $800/month as compensation for allowing us to use your vehicle as a mobile billboard. The amount of compensation depends on a variety of factors including vehicle coverage, location where the vehicle is driven, and duration of the campaign. These campaigns can last anywhere from a few months to 5 years. There are many companies out there who promise to pay you to drive or give you a list of companies who run programs like ours. Often they ask for a small payment or a monthly fee to give you access to this information. In most circumstances, if you pay them anything you will lose that money. Under no circumstances should you ever have to pay anything for trying to participate in these types of programs and MYC (Market Your Car) will never charge drivers for any of our services relating to our Get Paid to Drive Program. Programs such as ours are great and very unique. They are also very new and not as popular as they will be in the years to come. Many companies do not know that this advertising medium exists and as a result it could take a while for you to be chosen for one of our programs. There are more people interested in being drivers than there are companies who know about our program. Since we cannot guarantee when you will be chosen for a Get Paid to Drive program we will never ask for any money. To be eligible for our Get Paid to Drive Program you must fill out our online Registration Form. MYC will contact you once we have found a program for you. Installation takes approximately one full day. The selection process begins with a business wanting to advertise with us. We generally sit down with our customer and find out who they are, what they want to advertise, and who they want to advertise it to. We compile that information and begin searching through our database. Below are some of the key factors which help us select candidates for this program. Location - Location is the largest determinant for selecting a Driver. (Example: A business wants to advertise in its location. We would choose drivers who live and work around that area. Please note that it's important for you to fill out our registration form as completely and accurately as possible to increase your chances of being selected for a Get Paid to Drive Program. This information helps in the selection process for these programs. Register here, registration is Free. If you have any additional questions about how the Get Paid to Drive Program works, feel free to send us an email.